Uthappam / Ooththappam is a very popular South-Indian Tiffin veriety. There are so many Uthapam varieties. I thought of starting with the basic recipe - Plain Uthappam, as name indicates it does not have any toppings. Today lets see the recipe for Plain Uthapam, Butter Uthapam and Ghee Uthapam Varieties. The main difference between the dosa and Uthappam is that, dosa will be thin and crisp whereas the uthappam will be thick like pancakes. 2). Cook over low heat until small bubbles appear on the surface and the sides become golden color. 3). Flip the uthapam to the other side and cook in low flame for 2 minutes until crisp and golden. Press with spatula, it helps to cook faster and crisper. # The consistency of the batter is very important in the taste and texture of the uttapam. If the batter is too thick, then uttapam will be hard and will not turn golden & crisp. # If you are using normal dosa pan, start with rubbing a tsp of oil. 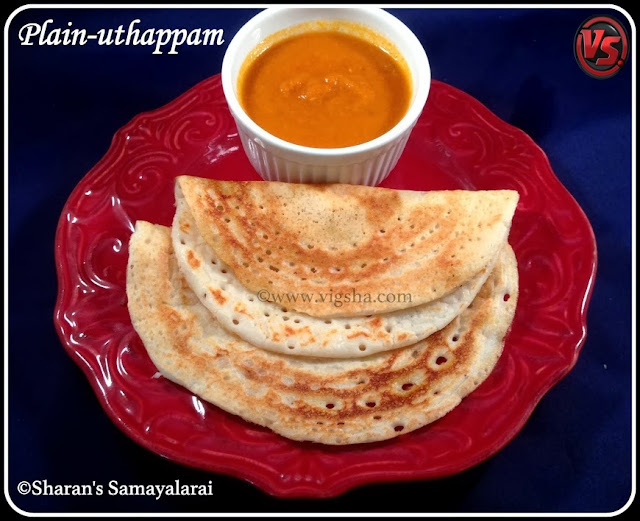 Follow the same procedure before making uthappam (for every uthappam you prepare). # Prepare uthappam in the Idli batter(thick) where as dosa batter will be thinner.